The top selling LifeGuide Bible Study series from IVP is now even better! The revised studies offer additional questions for starting discussions and for personal reflection, expanded leader's notes have been provided, and a flexible "Now or Later" section has been added to each study. About "Hosea (12 Studies) (Lifeguide Bible Study Series)"
These 12 lessons from the Book of Hosea are part of LifeGuide Bible Studies, a popular line of study guides that provide solid biblical content and raise thought-provoking issues in an easy-to-lead format. God never gives up. 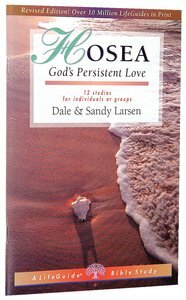 Even when you rebel, disobey or make a mistake, God continues to pursue you with a relentless love.As Dale and Sandy Larsen lead you through the fascinating Old Testament story of Hosea, you'll see how a godly man's unfailing love for his wayward wife illustrates God's unconditional, "no-holds-barred" love for you, too.This revised LifeGuide Bible Study features additional questions for starting group discussions and for meeting God in personal reflection, together with expanded leader's notes and a "Now or Later" section in each study. Dale Larsen is a writer living in Greenville, Illinois. He and his wife, Sandy, have written more than thirty books and Bible studies together including Images of God and Images of Christ. Sandy Larsen is a writer living in Rochester, Minnesota. SheSandy Larsen is a writer living in Rochester, Minnesota. She and her husband, Dale, have written more than thirty books and her husband, Dale, have written more than thirty books and Bible studies together including Images of God and Imageand Bible studies together including Images of God and Images of Christ. s of Christ. LIFEGUIDE inductive studies offer a careful blend of Scriptural study and personal application - with flexible formats, extra notes on tough Bible passages, and plenty of helps and hints for leaders. Written by respected Christian authors and packed with thought-provoking reflection and discussion questions, these workbooks are ideal for small groups and personal study. LifeGuide Bible studies offer a careful blend of inductive scriptural study and personal application. They offer flexible formats, extra notes on tough Bible passages, and plenty of helps and hints for leaders. Written by respected Christian authors and packed with thought-provoking reflection and discussion questions, these workbooks are ideal for small groups as well as personal study.